How to Determine If a Handheld Sewing Machine Is Good? Sewing machines have been around for a long time. The first sewing machine was invented during the Industrial Revolution and the purpose of this invention was to increase the productivity of clothing companies. The amount of time taken to sew garments was greatly reduced, thanks to the sewing machine. A sewing machine has gone through a lot of changes since its initial design. Now, there are more portable versions of sewing machines available. Back in the old days, it was difficult to stitch and sew by hand. Moreover, manual and tedious insertion of thread into the needle took some time – you needed a steady hand and keen eyes to insert the needle. Bulky sewing machines were introduced that required the use of foot and hand to propel the machine for sewing fabric with thread. These sewing machines were powerful and capable of stitching heavy fabrics like denim and leather. However, they weren’t portable and easy to use. To make sewing easier, the handheld version of sewing machines was created. Unlike its bigger, bulky predecessor, this version could be carried anywhere. People started using these machines because of their ease of operation. Nowadays, there are many handheld sewing machines available. If you don’t have a lot of space for sewing and crafting, handheld sewing machines could be a good choice for you. Handheld sewing machines are a versatile, convenient, and flexible solution for several sewing situations. For instance, if you want to sew on the go, you could use a handheld sewing machine. Depending on the handheld sewing machine you select, you can get your hands on a good alternative to a normal sewing machine that is not just portable, but is also strong enough for a variety of sewing tasks. If you are thinking about buying a handheld sewing machine, you should know that there are plenty of options to choose from. However, having some many options can make choosing a good handheld sewing machine difficult. To help you out, we have compiled a list of best handheld sewing machines. Before we discuss the best handheld sewing machines, let us take a look at some of the pros and cons of handheld sewing machines. Portability and convenience are probably two of the best qualities of a handheld sewing machine. They have made it more convenient to sew and they can be used for making accurate stitches. One important thing you should keep in mind is that handheld sewing machines aren’t meant to replace the traditional sewing machines. Even the best of these sewing machines cannot perform the same quality of sewing and stitching that you get from normal sewing machines. Some sewers use handheld sewing machines in the beginning when they are learning to sew. These machines are great for making crafts. The best handheld sewing machines are affordable and provide the straight stitch that must be mastered by beginners before they start expanding their capabilities. Many inexpensive handheld sewing machines are available on the market. However, these machines aren’t too durable. Moreover, one of the major difficulties people face with handheld sewing machines is that they struggle to understand the instructions on how these machines are to be used. Some people learn using them through perseverance and others watch videos for tutorials. What is the level of your current sewing skills? Do you want to advance your skills? Professionals are usually disappointed with the handheld sewing machines as they are not feature rich. Determine the types of sewing projects you will need to complete using the handling sewing machine. Handheld sewing machines are alright for lightweight fabricsbut aren’t good for heavier fabrics. There are a few characteristics that play a significant role in a handheld sewing machine’s quality. You must take these into consideration as well when purchasing a handheld sewing machine to ensure that you make the right decision. Needle quality determines how well a sewing machine will be able to sew. When you are buying a handheld sewing machine, you should check the quality of the needle as this feature is directly related to the performance of the machine. Some handheld sewing machines cannot handle certain types of material. When you are deciding to buy a handheld sewing machine, consider the types of fabric you will be sewing or mending with it. When you know the fabric, you can buy a handheld sewing machine that would suit your needs. The grip of a handheld sewing machine is a very important factor. A proper grip makes the sewing machine more comfortable. This is beneficial for those who want to stitch up fabrics for long periods of time. A proper grip also keeps the sewing machine stable when sewing. Not all handheld sewing machines allow the best precision. If your handheld sewing machine isn’t precise, you will end up with several useless stitches which you will have to redo. So, make sure to get a precise handheld sewing machine. Since the portability of a handheld sewing machine is its main selling point, this feature should always be on top of the priority list when you are shopping for a handheld sewing machine. Usually the smaller a handheld sewing machine, the more portable it is going to be. Handheld sewing machines can be powered with AA batteries or a power adapter. Some machines can be powered by both AA batteries and power adopter while others can only be powered with either an adopter or AA batteries. If you are going to sew in one place, it would be better to purchase a handheld sewing machine with adapter connectivity. 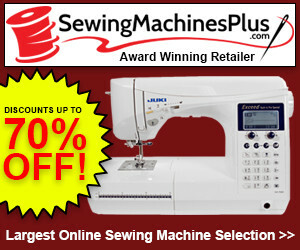 Singer has been the industry leader in sewing machines. It manufactures different varieties of sewing machines including handheld sewing machines. The small size of the Singer Stitch Quick 2 makes it easy for you to carry it in your purse. This handheld sewing machine is white in color and operates on 4 AA batteries or with a DC/AC adapter. 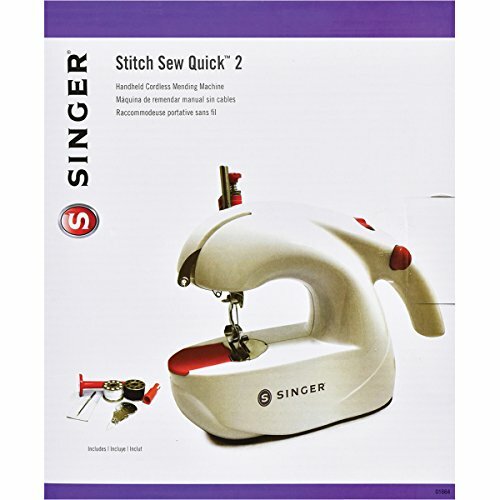 The Singer Stitch Quick 2 is a two-thread repairing machine and does not require a cord. Moreover, it is easy to maneuver for straight stitches. It is a good option for you if need a handheld sewing machine for some quick repairs. You can control the speed of the machine in two ways. The Singer Stitch Quick 2 also has an automatic winding function. 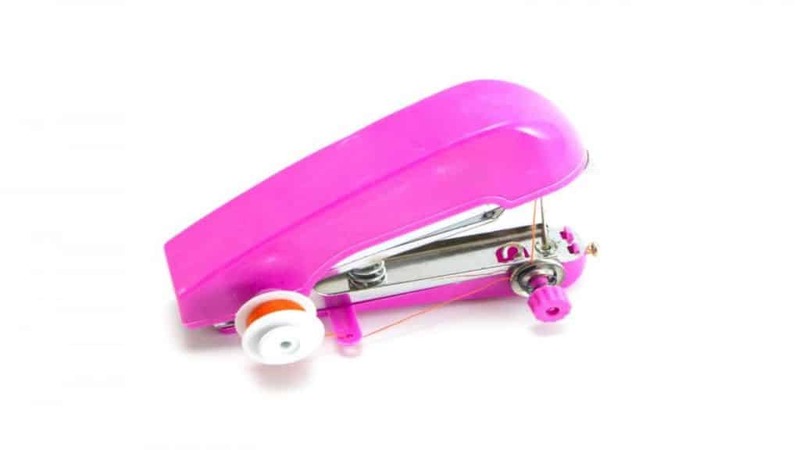 Accessories that come with this handheld sewing machine include bobbins, needles, threads, and thread spindle. The Singer Stitch Sew Quick comes with everything one could need to make a small repair immediately and Singer claims that this machine can also stitch heavy materials such as leather and denim. This product comes with a variety of needles, a needle threader, and several bobbins. AA batteries are generally used to power the Singer Stitch Sew Quick. Alternatively, you can use a power adapter. Singer has done a great job of ensuring that this handheld machine ticks all the relevant boxes. You won’t face any difficulties setting it up and it is easy to use. 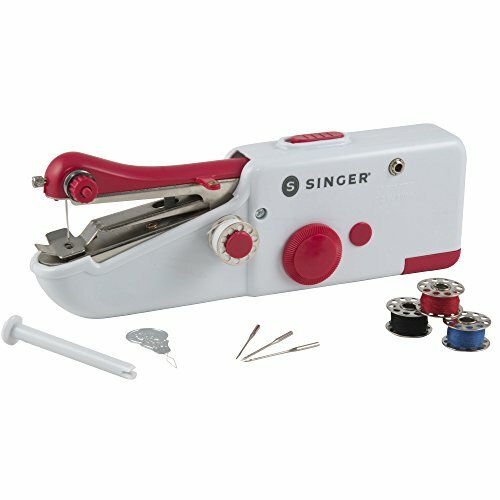 As with all the handheld sewing machines from Singer, this model is capable of working on a variety of different fabrics. The features of this machine allow users to vary the length and width of the stitch to create more creative designs. The holes that the Singer Stitch Sew Quick provides are small and so at times, it can be difficult to see where you’re stitching. Despite this, this is the best handheld sewing machine from Singer for anyone looking for a portable and easy-to-use sewing machine. It is also affordable and more durable than most of the other handheld sewing machines currently available on the market. Stitch Sew Quick has gotten bad reviews from purchasers. The main reason for this is that people don’t really understand what these types of handheld machines are developed for. Customers who know the limits of handheld sewing machines usually give good reviews to the Stitch Sew Quick. It is a lightweight and efficient handheld sewing machine. Despite not having much weight, the Singer Stitch Sew Quick can perform almost all basic tasks that you would expect a handheld sewing machine to perform. If you want to determine if a certain handheld sewing machine is good or not, you should check its online reviews. Many times, online reviews can help you decide whether a sewing machine is right for you or not. However, be wary of fake reviews as many companies try to degrade other brands by posting bad reviews about their sewing machines. The two Singer sewing machines discussed above have average reviews and we believe that the main reason behind this is that many of the reviews are deceptive. You should visit online forums where people talk about sewing machines and create your own post to inquire about the Singer brand and the handheld sewing machines it produces. You can also ask your neighbors and friends about the handheld sewing machines they use. In a nutshell, if you are looking for a best handheld sewing machine, then we recommend you choose between the Singer Stitch Sew Quick and Singer Stitch Quick 2. These are by far the best handheld sewing machines available in the market. Both of them can perform basic sewing tasks and are durable enough to last for a long period of time. When you have a handheld sewing machine, you will be able to complete minor repairs and easily perform basic sewing tasks. You won’t have to spend a lot of money on a bulky and expensive sewing machine to handle basic sewing tasks. Not only that, but you will be able to carry your sewing machine with you and sew on the go. So, go ahead and purchase a handheld sewing machine. It’ll be of great help in your sewing projects.